Create fantastic handmade Christmas craft projects to give to family and friends. The range features new editions including exclusive dies and embossing folders. 1. Cut a piece of gold gingham paper to 14.5x14.5cm and mount of dark red textured card leaving 2mm around the corner. Glue to a 6x6 scalloped card. 2. Using the sentiment paper cut a 10.5x10.5cm square and layer on the red card, glue down in the centre on a slight angle. 3. Cut a strip of the striped paper to 13.5x5cm, mount of red card and fix to the middle of the card blank. 4. Trim the green mistletoe paper to 8.5x7.5cm, layer on red card then stick the Tatty Teddy red heart sticker in the centre, stick to the card using foam squares. 5. Finish with sparkly green gems and the warm wishes sentiment topper. 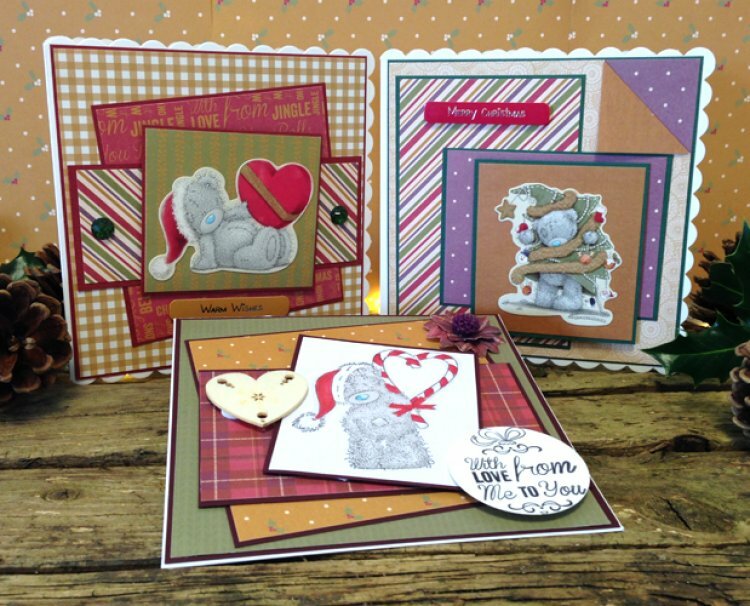 Add a personal touch to your Christmas cards by colouring in this fab Tatty Teddy stamped image. 1. Stamp the Tatty Teddy image on to white card and trim to 7.5x 9cms, colour the images then layer on burgundy card, set aside for later. 2. Cut a piece of green card to 14.5x14.5cm, layer on burgundy card leaving a 2mm border. Glue onto a 6x6 white card blank. 3. Trim the mustard holly paper to 12.5x12.5cm, layer on the burgundy card then stick down at an angle in the centre of the card. 4. Cut a piece of tartan paper to 13x8cm, layer on burgundy card and mount on the card blank. 5. Stick the stamped image onto the card using foam squares and then embellish with paper blossoms, wooden heart and stamped sentiment. 1. Cut a piece of purple polka and gold doily card to 14.5x14.5cm, glue the polka card onto green textured card leaving a 1mm border, on the gold doily paper score the top right corner and fold back to show the double sided print. Glue down leaving the flap free. 2. Cut a rectangle of striped paper to 8.5x12.5cm, layer on green card then glue to the left hand side of the card. Repeat with the purple polka cut to 10x7.5cm, layer on green card then glue down. 3. Stick the Christmas tree glitter sticker onto the brown paper, trim to 7.5x8.5cm and layer on green card, mount on the card using foam squares. 4. Finish by gluing the card onto a 6x6 scalloped card blank and add the Merry Christmas sentiment topper. We hope you love the new Me to You Christmas craft collection and enjoy using it for your Christmas projects, show us what you make in our project gallery.